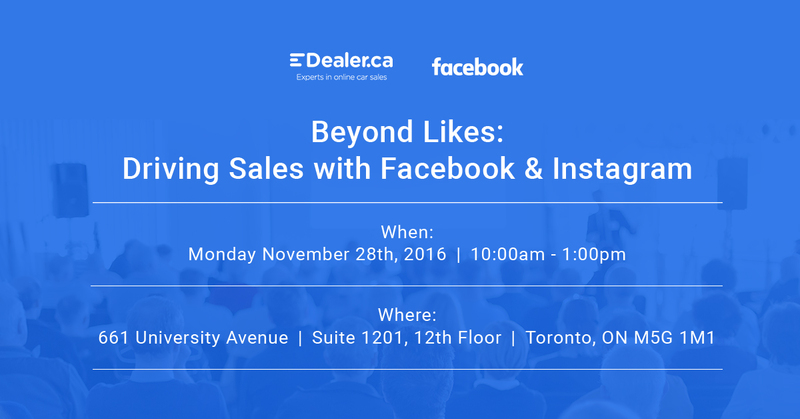 On Monday, November 28th, 2016 we will be hosting a lunch-and-learn at Facebook’s Toronto office titled Beyond Likes: Driving Sales with Facebook & Instagram. Facebook & Instagram are two of the biggest social media platforms in the world. Many dealers have been posting on these platforms organically, building a small community and in some cases promoting their posts to expand their reach beyond their current audience. While this is valuable, few dealerships have been leveraging the powerful ad engine behind both platforms and that is the focus of Beyond Likes: Driving Sales with Facebook & Instagram. The advertising engine behind Facebook and Instagram allows dealers to fulfill goals in all areas of their business from new to service, used to credit and everything in between. Dealers will learn about the flexible ad types that can build brand awareness, drive website traffic, empower offer claims and generate leads at a cheaper cost-per-lead than dealers are accustomed to. Furthermore, dealers will learn about the creative possibilities of Facebook and Instagram ads that include an image or video, ad copy, ad headline, CTA button and links back to the dealership website. These ad types offer you more characters and visual space to share offers with customers and drive traffic to your website at a cheaper cost-per-click than seen on other platforms. Dealers will also learn about the targeting abilities of Facebook and Instagram. Among other things, these ads will help reach the elusive millenial market while continuing to capture the traditional car buyer demographic. Your dealership’s digital marketing budget for 2017 is increasing and there’s no better place to spend those new dollars than on Facebook & Instagram. In 2017, go beyond likes, start driving car sales with Facebook & Instagram. Thank you to all those who attended the event! Stay tuned for a breakdown of the day coming soon.